Aim: The aim was to determine the effect of four different intracanal medicaments on the apical seal of the root canal system in vitro. Methodology: Fifty freshly extracted intact human permanent maxillary central incisors were collected, stored and disinfected. The root canals were prepared to a master apical size of number 50 using step back technique. Depending upon the intracanal medicament used, the teeth were divided randomly into five groups of 10 teeth each including one control group and four experimental groups. Group A: No intracanal medicament. Group B: Calcium hydroxide powder mixed with distilled water. Group C: Calcium hydroxide gutta percha points (calcium hydroxide points). Group D: 1% chlorhexidine gel (hexigel). Group E: Chlorhexidine gutta percha points (Roeko Activ Points). The medication was left in canals for 14 days. Following removal of the intracanal medicament, all the groups were obturated with lateral compaction technique. The apical leakage was then evaluated using dye extraction method with the help of a spectrophotometer. Results: Results were statistically analyzed using Kruskal-Wallis and Mann-Whitney U-test, which showed statistically significant difference among the five groups tested. Conclusion: It can be concluded from this study that the control group showed least amount of leakage, whereas the 1% chlorhexidine gel group showed maximum amount of leakage. Apical leakage was observed with all the experimental groups with little variations in between them. Under the parameters of this study, it can be concluded that use of intracanal medicaments during endodontic treatment has a definite impact on the apical seal of the root canal system. Hence, the aim of the present study was to determine the effect of four different intracanal medicaments on the apical seal of the root canal system. Fifty freshly extracted human permanent, non-carious, maxillary central incisors with straight roots, single canals and mature apices were used in this study. The teeth with calcified canals, extra canals, curved canals, external or internal resorption or previous restorations were excluded. Their external surfaces were cleaned with curettes to remove any calculus or soft tissue debris. The teeth were collected and initially stored in a wide mouthed plastic jar containing 0.5% sodium hypochlorite (Vensons India Co.). They were disinfected by immersing the collected teeth in 5% sodium hypochlorite for at least ΍ h. The teeth were rinsed with tap water before use. To facilitate instrumentation, the crown of each tooth was removed at cemento-enamel junction using diamond disc. To eliminate root length as a variable, only teeth with roots 12-15 mm long were used. The canal contents were grossly debrided with barbed broaches (Dentsply Maillefer Ballaigues, Switzerland) and irrigated with 2.5% sodium hypochlorite. The working length was determined by placing number 10 K file (Dentsply Co.) into the canal and advancing it until it was just seen at the apical foramen, after which 1 mm was subtracted from this and working length was recorded. The canals were prepared with stainless steel K files in sequential order beginning with number 15 to number 50 at the working length. Between each file use, the canals were irrigated with 1 ml of 2.5% sodium hypochlorite and saline using a 22 gauge needle alternatively. Patency was confirmed between files using a number 10 stainless steel K file. Following apical preparation, the canals were flared with number 55, number 60, number 70 and number 80 K files in step back fashion 2, 3, 4, and 5 mm short of working length respectively. Irrigation was done in the manner previously described. Further coronal enlargement was accomplished with a number 3 and number 4 Gates Glidden drill (Dentsply Co.). The smear layer was removed using 3 ml of 17% ethylene diamine tetraacetic acid (EDTA) solution followed by 3 ml of 2.5% sodium hypochlorite. Final rinse was accomplished with 3 ml of physiologic saline. Upon completion of instrumentation, the canals were dried utilizing absorbent points. The teeth were then randomly divided into five groups of 10 teeth each comprising of one control group and four experimental groups. Four different intracanal medicaments viz. calcium hydroxide powder (Deepti Dental Products of India), calcium hydroxide active points (Coltene Whaledent), 1% chlorhexidine gel (Hexidine gel; ICPA Health Product Private limited) and Chlorhexidine points (Roeko Activ Points; Coltene Whaledent) were used in the experimental groups for 2 weeks. In the control Group A, no medicament was placed but they were sealed coronally with intermediate restorative material (Dentsply Co.). In the experimental Group B, calcium hydroxide paste was made by mixing calcium hydroxide powder with distilled water at a powder liquid ratio of 1:1.25. The calcium hydroxide paste was placed in the canal with the use of lentulospiral (Dentsply Co.). In Group C, calcium hydroxide active point of master apical size (number 50) was placed using a tweezer. The excess of the active point was folded into the canal to facilitate its removal later on. In Group D, 1% chlorhexidine gel was placed in the canals using a capillary tip (Ultradent Co.). In Group E, chlorhexidine active points of master apical size (number 50) was placed using a tweezer. The access cavities of experimental teeth were sealed with 1 mm of cotton pellet and 1 mm layer of intermediate restorative material and were stored in isotonic saline for 14 days. At the end of the experimental period, the intracanal medicaments were removed from the experimental groups. In experimental Groups B and D, the canals were irrigated copiously with 2.5% sodium hypochlorite and saline and number 50 size K file was used in the filing motion up to the working length to ensure complete removal of the intracanal medicaments. In Groups C and E, after removing the temporary restorative material the excess folded active point was pulled out of the canal using a tweezer. The canals were irrigated and instrumented with a number 50 size K file to ensure removal of any remaining material adhering to the canal wall. The canals were irrigated again with 3 ml of sodium hypochlorite and dried using absorbent points. Smear layer was removed using 17% EDTA in all the teeth. Both the experimental and control group were obturated with the gutta percha (0.02 taper; Dentsply Co.) using lateral compaction technique and AH Plus sealer (Dentsply Co.). After obturation, the excess gutta percha was removed with a heated instrument and the access cavity was sealed with type II Glass Ionomer Cement (GC Company). The apical seal was evaluated for all the teeth including control and experimental groups using dye extraction method. The teeth were covered with two layers of nail varnish except for the last apical 2 mm. The teeth were submerged in glass vials for 24 h at 37°C in neutral buffered 2% methylene blue solution, under normal atmospheric pressure. The teeth were rinsed under tap water for 30 min, and the varnish was removed with polishing disks mounted on a handpiece. The teeth were stored in a hermetic sealed vial containing 600 μl of concentrated nitric acid for three days. The vials were then centrifuged at 10,000 rpm for 10 min. A volume of 200 μl of supernatant was taken from each vial and the absorbance was determined at 550 nm using a spectrophotometer (Statfax -2100; Awareness Technology). The data obtained was statistically analyzed using Mann-Whitney U-Test and Kruskal-Wallis test. The significance value was set at P ≤ 0.05. The absorbance value for each sample was recorded and was tabulated [Figure 1]. 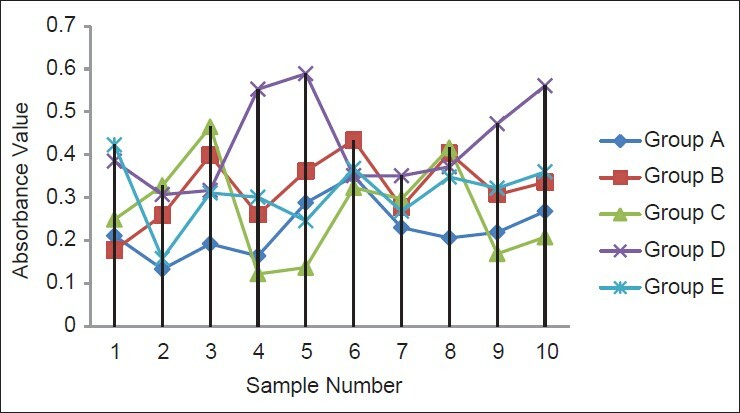 The mean for all the groups was calculated along with a standard deviation [Figure 2] and subjected to statistical analysis using Kruskal-Wallis test followed by intergroup comparison using Mann-Whitney U-test. 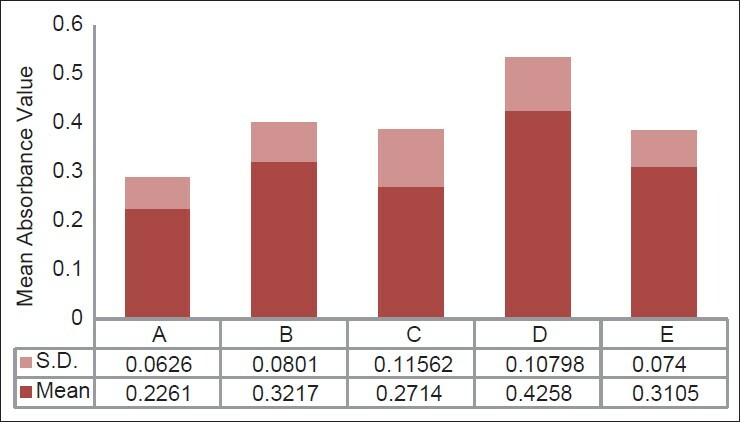 The mean absorbance obtained was in the following order [Table 1]; A < C < E < B < D. The results obtained showed that control group had the least amount of leakage, whereas chlorhexidine gel when used as an intracanal medicament exhibited the highest amount of apical leakage. The medicated gutta percha points whether calcium hydroxide based, or chlorhexidine based were found to be better than calcium hydroxide paste in terms of apical leakage. Furthermore, the data were subjected to Mann-Whitney U-test to determine the intergroup comparison. The significance values obtained were mixed, which are depicted in [Table 2]. In this study, extracted human teeth were used to improve reliability by simulating the clinical situation. Maxillary central incisors with straight roots, mature apices and single patent root canals were selected to minimize anatomical variation and allow standardization. Decoronization was done in order to facilitate instrumentation and also to allow standardization. In the present study, the smear layer was removed to facilitate penetration of the intracanal medicaments. Nerwich et al. demonstrated in their study that the hydroxyl ions derived from a calcium hydroxide intracanal dressing diffuse in a matter of hours into the root dentin but require 2-3 weeks to reach peak levels. Intracanal medicament was given for fourteen days as this is the period commonly used between appointments (especially calcium hydroxide). To minimize any apical leakage due to the possible interaction between calcium hydroxide and eugenol, resin based AH Plus sealer was used in this study. Leakage at the apex occurs between the root canal wall and the sealer, between the sealer and the gutta percha, or within the sealer itself. In the present study, all the specimens were coated with the nail varnish on their root surface to exclude any possible leakage through the dentin surface to leave only apical pathways. The roots were placed in methylene blue dye after 24 h to ensure setting of the AH Plus root canal sealer as per manufacturer's recommendations. The dye extraction technique presents a drawback that should have been taken into account. The apical 2 mm of the apex exposed to dye penetration was not covered with varnish, permitting dye to penetrate into apical dentin that was dyed blue even after washing the roots. On the contrary, the dye extraction technique required only 3 days because the absorbance of all the teeth could be recorded at the same time. The dye extraction or dissolution technique is promising and rapid. In this study, only the amount of dye absorbed is measured whereas the depth of penetration is not taken into account. The dye might have penetrated into the anatomical variations such as apical deltas, lateral canals, accessory canals and would have resulted in the higher amount of leakage observed giving higher readings. In the light of the present study, additional experimentation is needed to analyze the exact cause of the breakdown of the apical seal and to devise a method for complete removal of intracanal medicament in order to prevent apical microleakage. In the present study spectrophotometric evaluation was done to quantitatively analyze the extent of dye leakage using methylene blue dye for evaluation of apical seal following the use of four different intracanal medicaments. 903; The 1% chlorhexidine gel group showed the maximum amount of leakage that was statistically insignificant when compared to the calcium hydroxide powder group. Bystrom A, Claesson R, Sundqvist G. The antibacterial effect of camphorated paramonochlorophenol, camphorated phenol and calcium hydroxide in the treatment of infected root canals. Endod Dent Traumatol 1985;1:170-5. Caliskan MK, Sen BH. Endodontic treatment of teeth with apical periodontitis using calcium hydroxide: A long-term study. Endod Dent Traumatol 1996;12:215-21. Staehle HJ, Spiess V, Heinecke A, Müller HP. Effect of root canal filling materials containing calcium hydroxide on the alkalinity of root dentin. Endod Dent Traumatol 1995;11:163-8. Lohbauer U, Gambarini G, Ebert J, Dasch W, Petschelt A. Calcium release and pH-characteristics of calcium hydroxide plus points. Int Endod J 2005;38:683-9. Evans MD, Baumgartner JC, Khemaleelakul SU, Xia T. Efficacy of calcium hydroxide: Chlorhexidine paste as an intracanal medication in bovine dentin. J Endod 2003;29:338-9. Barthel CR, Zimmer S, Zilliges S, Schiller R, Göbel UB, Roulet JF. In situ antimicrobial effectiveness of chlorhexidine and calcium hydroxide: Gel and paste versus gutta-percha points. J Endod 2002;28:427-30. Tamse A, Katz A, Kablan F. Comparison of apical leakage shown by four different dyes with two evaluating methods. Int Endod J 1998;31:333-7. Harris BM, Wendt SL Jr. The effects of a petroleum-based ointment and water-based cream on apical seal. J Endod 1987;13:122-5. Kim SK, Kim YO. Influence of calcium hydroxide intracanal medication on apical seal. Int Endod J 2002;35:623-8. Lambrianidis T, Margelos J, Beltes P. Removal efficiency of calcium hydroxide dressing from the root canal. J Endod 1999;25:85-8. Basrani B, Ghanem A, Tjäderhane L. Physical and chemical properties of chlorhexidine and calcium hydroxide-containing medications. J Endod 2004;30:413-7. Wuerch RM, Apicella MJ, Mines P, Yancich PJ, Pashley DH. Effect of 2% chlorhexidine gel as an intracanal medication on the apical seal of the root-canal system. J Endod 2004;30:788-91. Fava LR, Saunders WP. Calcium hydroxide pastes: Classification and clinical indications. Int Endod J 1999;32:257-82. Ardeshna SM, Qualtrough AJ, Worthington HV. An in vitro comparison of pH changes in root dentine following canal dressing with calcium hydroxide points and a conventional calcium hydroxide paste. Int Endod J 2002;35:239-44. Barbosa CA, Gonçalves RB, Siqueira JF Jr, De Uzeda M. Evaluation of the antibacterial activities of calcium hydroxide, chlorhexidine, and camphorated paramonochlorophenol as intracanal medicament. A clinical and laboratory study. J Endod 1997;23:297-300. Siqueira JF Jr, de Uzeda M. Intracanal medicaments: Evaluation of the antibacterial effects of chlorhexidine, metronidazole, and calcium hydroxide associated with three vehicles. J Endod 1997;23:167-9. Lui JN, Sae-Lim V, Song KP, Chen NN. In vitro antimicrobial effect of chlorhexidine-impregnated gutta percha points on Enterococcus faecalis. Int Endod J 2004;37:105-13. Menezes MM, Valera MC, Jorge AO, Koga-Ito CY, Camargo CH, Mancini MN. In vitro evaluation of the effectiveness of irrigants and intracanal medicaments on microorganisms within root canals. Int Endod J 2004;37:311-9. Zakariasen KL, Douglas WH, Stadem P. Comparisons of volumetric and linear measurements of root canal leakage. J Dent Res 1981;60:627. Abstr No. 1273. Caliskan MK, Türkün M, Türkün LS. Effect of calcium hydroxide as an intracanal dressing on apical leakage. Int Endod J 1998;31:173-7. Economides N, Koulaouzidou EA, Beltes P, Kortsaris AH. In vitro release of hydroxyl ions from calcium hydroxide gutta-percha points. J Endod 1999;25:481-2. Porkaew P, Retief DH, Barfield RD, Lacefield WR, Soong SJ. Effects of calcium hydroxide paste as an intracanal medicament on apical seal. J Endod 1990;16:369-74. Holland R, Alexandre AC, Murata SS, dos Santos CA, Dezan Júnior E. Apical leakage following root canal dressing with calcium hydroxide. Endod Dent Traumatol 1995;11:261-3. Holland R, Murata SS, Dezan E, Garlipp O. Apical leakage after root canal filling with an experimental calcium hydroxide gutta-percha point. J Endod 1996;22:71-3. Kontakiotis EG, Wu MK, Wesselink PR. Effect of calcium hydroxide dressing on seal of permanent root filling. Endod Dent Traumatol 1997;13:281-4. Hosoya N, Kurayama H, Iino F, Arai T. Effects of calcium hydroxide on physical and sealing properties of canal sealers. Int Endod J 2004;37:178-84. Camps J, Pashley D. Reliability of the dye penetration studies. J Endod 2003;29:592-4.